I had gone into an hibernation of sorts on the blogging front and decided to breathe some life into my space here which has kept me company on my culinary adventures and experiments. I made a healthy tomato soup a few weeks ago, even took pics when the sun decided to shine on us amidst the bleak gloomy overcast days, but never got around to sharing it on here. So here it is, the Cream of Tomato soup made restaurant style but within the confines of your own home kitchen. Cream of Tomato soup is one of the most popular soups served in almost any restaurant across India that takes pride in serving up multi-regional cuisine. Tomato soup is a crowd favorite and undoubtedly the most ordered too. Heck, even the Indian Railways serves up a thinned down, remotely tomatoey tasting version of this soup. There are a zillion versions on how to make tomato soup; this is just one of them adapted from the recipe used at our family restaurant back in the day. The Indian version of the Cream of Tomato soup, is a thick creamy soup topped with deep fried bread croutons that make the soup taste sooo good albeit the croutons aren’t screaming healthy. Most restaurants also use food color to get the bright red soup. When you make it at home however, you get to choose to what’s in your soup and what’s not. *Note: Leeks aren’t traditionally used in cream of tomato soup, they are not easily available in India either. I chose to use them since I had them on hand. Can substitute with chopped celery too or leave it out altogether. Wash and chop the tomatoes into chunks. In a deep pan, heat the oil and add the bay leaf. When it begins to sizzle, add the chopped garlic and onions. Saute for 2 minutes. Now add the chopped carrots and leeks. Cook on medium heat until the carrots are soft. Now add the tomatoes and cover the pan with a lid. Cook for 5-6 minutes until the tomatoes are cooked and all the veggies are done. Season with salt and pepper powder. Allow to cool completely. Remove the bay leaf and discard. Blend the cooled mixture until smooth. Use as little water as possible. I didn’t have to use any. Return the blended soup to the same pan and turn heat to medium. Simmer on low, if it feels too thick add little water. It should have a pourable consistency. Taste and add sugar if the soup is sour, the tomatoes impart tanginess. Adjust sugar and seasonings as required. Simmer for 2 minutes and turn off heat. Preheat oven to 300F. Trim the sides of the bread and cut into bite sized cubes. Toss with the olive oil, garlic powder and salt on a baking sheet. Spread evenly and bake in pre-heated oven for 15-18 minutes until crisp and golden. Toss cubes once while baking. 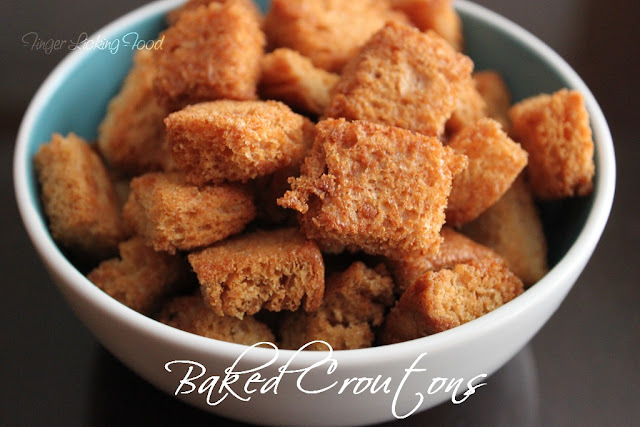 Store cooled croutons in an air-tight container and use as required. Ladle hot soup into bowls, top with croutons and serve immediately. Voila! A healthy home-made soup is all yours to slurp on. I resisted the temptation to garnish my soup with cream, staying true to the healthy part. But if you don’t mind some cream in there, then go ahead and garnish it like this. This soup is so creamy and delicious the way it is, I promise you won’t miss the deep fried croutons ;) Enjoy! super yummy...tomato soup is my fav...this one luks great...i love d idea of baked croutons ! I don't mind a bowl..looks creamylicious! 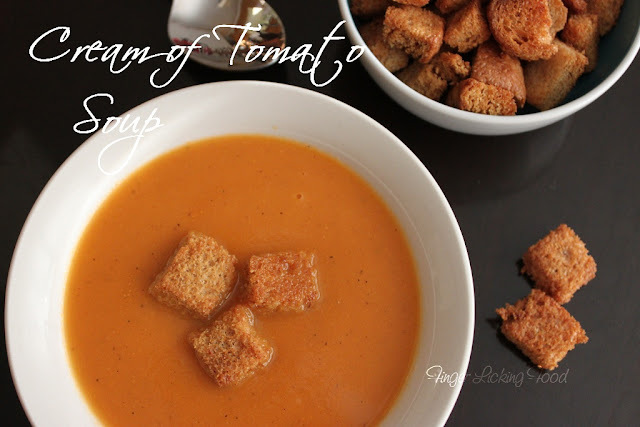 Cream of tomato soup is one of my favorite and the croutons make it extra special! Looks awesome.